While many pools, especially older ones, have a deck that cantilevers over the pool wall, coping is the trending, typical way a pool is bordered at deck level. Coping provides an aesthetic trim around the pool, usually in an 8”-16” band, depending on pool wall thickness and material chosen. Like tile, coping allows you to customize the look of your pool. There is a wide variety of materials available for coping installation. Several factors will dictate which material is best to use for each renovation situation. These include the thickness and width of the existing coping or cantilever deck (which can be cut and removed to make way for coping), cost, and the overall look you have in mind. 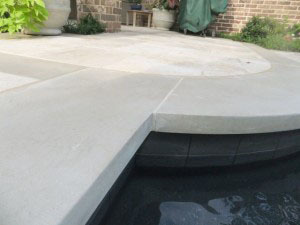 Flagstone coping is in many cases less expensive than limestone coping and is installed where a customer desires a more rugged, freeform look. Limestone and travertine are used where clean, smooth lines will complement the shape of the pool and the type of tile installed. There are even man-made, pre-cast coping materials, though these are less popular recently. Regardless of which you choose, expert installation/repair is a must in order to preserve the integrity of the coping and the materials surrounding it. Because the coping interfaces with deck and with the tile below it, expert craftsmanship is imperative. If your tile is coming loose, or if there is a crack in the grout joint above the tile, your coping is likely loose. This is typically the result of deck movement and an inadequate buffer between deck and coping. For coping or cantilever deck replacement, we seek to insure there is no means of conflict between the coping and deck as best we can. Then, we apply expansion joint caulking, an elastomeric caulk that flexes with deck movement, to seal the space between coping and deck and provide the isolation critical to the integrity of the materials installed. If you like the look of your coping or if replacement cost is beyond what you care to spend, picking up and resetting your existing, loose coping can allow us to reduce the conflict between deck and coping as much as possible. Whether you are seeking a new look for the border of your pool or you have loose coping that may be unsafe and threatens the integrity of your tile, we can offer recommendations that, depending on each situation, can improve the look and longevity of your pool. Give us a call to discuss your coping options with one of our renovation specialists.